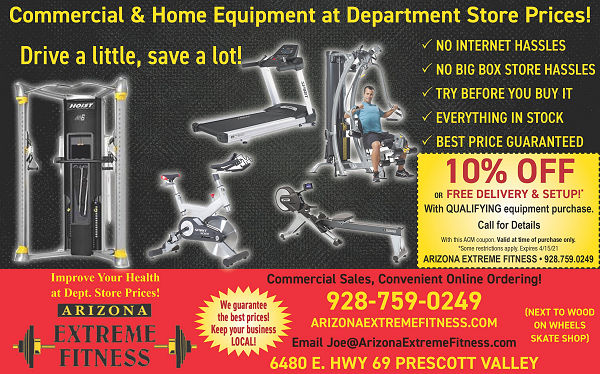 Here at Arizona Extreme Fitness we offer a large selection of sporting goods, service and fitness products, like Treadmills, Ellipticals, Recumbent Bikes, Upright Bikes, Rowers, Steppers, Gym Units, Benches, Weights and Lifting supplies. We have 30 years of experience in the exercise and fitness business. We service what we sell and most all the fitness products that we sell have three year to lifetime warranty's - the best in the industry. We offer delivery and setup services for the Prescott, Flagstaff, Sedona and Phoenix, Arizona regional areas. 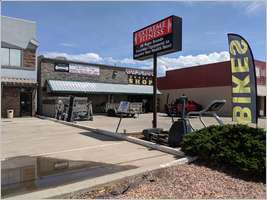 You can call me direct at 928.759.0249 I have over 30 years experience in the fitness equipment industry and will be happy to assist you in finding just the right solution for YOU. Your customer satisfaction is our ultimate concern! Coupon good, only at time of purchase! We have the biggest selection of fitness equipment in stock on the floor in Arizona with over 3000 sq ft on display and another 3000 sq. ft. in inventory. 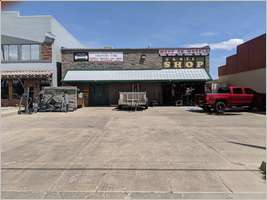 We invite you to come on out to our store in Prescott Valley, Arizona, see the equipment, get a demonstration and even try out the equipment before you buy. Delivery and Setup available for ... Prescott, Sedona, Cottonwood, Flagstaff, Verde Valley, Phoenix and most surrounding areas. Our Health Goals for you are to . . .
Help you develop to a better quality of life. Help you develop more energy. Help you lower your blood pressure. Help you increase muscle mass. The regular use of quality, safe and well designed for the purposes intended health fitness exercise equipment, along with learning good eating habits has been undeniably proven to contribute to your overall better health and happiness. We carry home and commercial grade equipment in all product categories! Listed below are just some of the 1000's of exercise fitness items we carry on our show room floor or in warehouse inventory. We also stock lots of accessories and specialty items but if we don't have it we can get it for you!